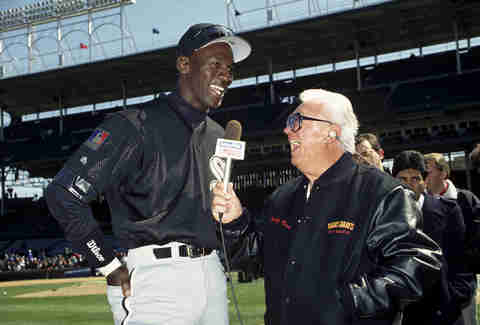 How Many Beers Did Harry Caray Drink in His Lifetime? An Investigation. 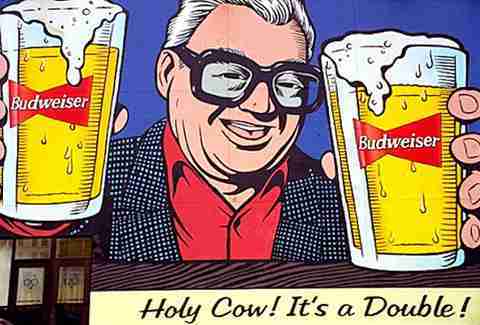 It’s no secret that Harry Caray liked to drink. A lot. 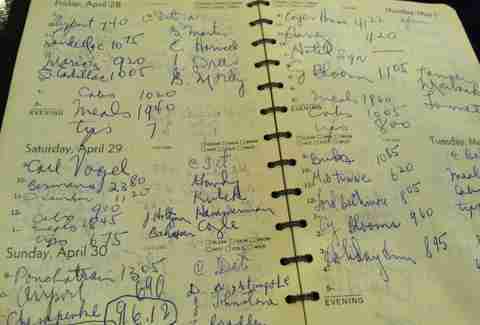 A 1972 drinking diary unearthed last year proves as much, with the legendary broadcaster documenting (reportedly for tax purposes) every drink he bought for a year in which he spent 288 consecutive days -- and at least 354 days total -- drinking in bars. 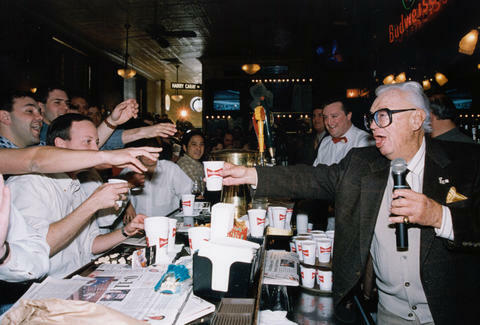 While the revelation of the diary made national news at the time, no one bothered to try and answer the one essential question left unanswered: how many beers did Harry Caray drink in his entire lifetime? So we did. ... and CEO of Harry Caray’s Restaurant Group, who told us that he once spoke with Caray in 1997 (one year before his death) about this very topic. This was the year the Cubs set a National League record for consecutive losses and DePorter dropped the price of beer to 45 cents (and sold 50,000 of them). He said that Harry told DePorter that he drank 300,000 total drinks in his lifetime (73,000 of them Budweisers). What Harry didn’t tell DePorter was the number of TOTAL beers he drank. Yes, Harry was a famous Bud man, but how many of those 300,000 drinks were beer (Budweisers + non-Budweisers) and how many were cocktails (Bombay Sapphire martinis were his drink of choice)? The essential objective then became determining how many non-Bud beers he consumed in his life. ... except that Harry drank with WILT CHAMBERLAIN and TED WILLIAMS. We flipped through the pages of the diary with DePorter and, while it listed the names of bars, the total amount spent at each bar, and who he was drinking with, it did not break down the types of drinks. That said, we did find out that Harry drank with everyone from Ted Williams and Joe Pepitone to Wilt Chamberlain and Jack Dempsey. Also noted in the diary? A total of 1,242 documented bar stops, the most popular of which was Sully’s (now the Hangge-Uppe), frequented by Caray a total of SEVENTY times in 1972. He would often visit five to six bars a night and, according to Keith Olbermann, spent $6,961 on booze that year -- at a time when a six-pack of Old Style cost $1.29 (according to math, that would've been 14.7 6-packs a day). The former Mother Hubbard’s owner said Harry would typically start boozing with friends with an early lunch before the game, drink throughout the game, and then come by Rittenberg’s clubs (he owned several local clubs at the time), where they “kept rolling” until 9pm or 10pm at night. His reputation in the local bars grew so prominent that he was declared the “Mayor of Rush St” in the late '70s, where he could often be found buying people Budweisers in local taverns. 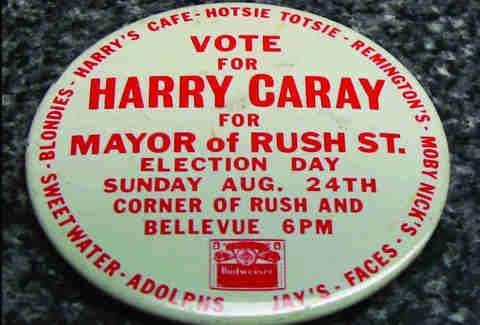 Even then-Mayor Jane Byrne got on board, ceding Rush St to Harry. Harry Carabina, born in a poor section of St. Louis in 1914, spent 25 years calling games in St. Louis for the Cardinals from 1945-1969, until he was fired for reportedly having an affair with August Busch III’s wife (a charge Harry never officially denied). It was here that he was sponsored by and drank Budweiser exclusively, but it wasn’t until his move to Chicago (after one year calling games for the A’s in Oakland) that his drinking truly reached momentous proportions. In fact, Harry’s biggest drinking years were most likely during the early ‘70s (the time in which the drinking journals were kept), when Harry was calling games (sometimes shirtless) for the White Sox. 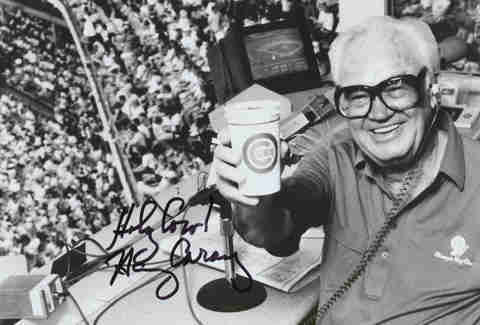 During his Sox years, from 1971-1982, Harry drank the now-defunct Falstaff, not Budweiser, but would return to drinking Bud after joining the Cubs, where he most famously held court in the Friendly Confines from 1982-1997. Harry lived just shy of 84 years and we can assume he was drinking for 65 of those years (removing the last one or two years of his life when he slowed down and would drink O’Douls, yet would still pour it in a beer mug and pretend to drink Budweiser at games). So, Harry told DePorter that he drank 73,000 Budweisers over his life. Over 41 years of drinking Budweiser (25 years with St. Louis and 16 with the Cubs), this averages 1,780 beers a year or 4.9 beers a day. But that still leaves 24 drinking years of his life (his White Sox days -- aka the Falstaff era -- and pre-broadcasting years when he wasn't being financially coerced into drinking Bud) unaccounted for. Assuming the same rate of 4.9 beers a day over those 24 years, that is an additional 42,924 beers. THE GRAND TOTAL? 115,924 BEERS. Or to err on the safe side, accounting for year-to-year fluctuations in consumption rate (not every year can sustain 288-day drinking benders like 1972), a more conservative estimate would be between 110,000 to 120,000 beers. Either way, that’s a helluva lot of beer. The most mind-blowing thing we learned, though? 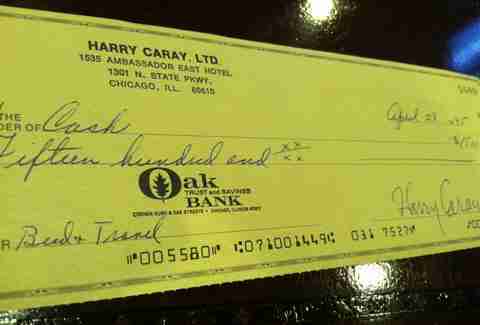 That Harry Caray, the famous “Cub Fan Bud Man,” drank MORE COCKTAILS THAN BEERS. Assuming the 115,924 beers figure to be accurate, and according to the 300,000 total lifetime drinks number given to DePorter -- which comes to an astonishing 12.6 drinks per day -- Harry drank 184,076 mixed drinks and 115,924 beers in his lifetime. Jay Gentile is Thrillist’s Chicago Editor and he hopes one day someone will write an article about his drinking journal. Follow him @ThrillistChi.